The ongoing confusion involving expensive prescription custom orthotics and relatively inexpensive over-the-counter arch supports lies not only in their purported efficacy but in the plethora of choices offered on-line and in retail stores as well as in medical offices. Foam molds to make foot impressions are available from on-line marketers, and Amazon lists no fewer than twenty different arch supports, wraps, and braces proven to resolve your foot pain. A Parade Magazine advertisement touts a reflexology- like device guaranteeing weight loss with frequent use. CVS stores have partnered with Dr. Scholl’s to prescribe a specific arch device based on data obtained from stepping on an in-store pressure measuring machine. There are also many varieties of prescription custom orthotics that are made at ski shops by boot fitters, in specialty shoe stores by shoe salesmen or orthotists, by chiropractors, physical therapists, or podiatrists. Over-the-counter (“OTC”) arch supports are often sought out or recommended as a first line of treatment since they are much less expensive and readily accessible. The best OTC devices are the ones modelled after prescription ones; but their limitation is an inability to modify it to address a person’s specific pathology. OTC’s may also need to be replaced every few months compared to most prescription orthotics that last for years with minimal refurbishment, so custom orthotics may actually be more economical. Prescription orthotics are usually classified as accommodative (more flexible) or functional (more rigid), and are patient-specific, prescribed to address more serious problems derived from a detailed clinical and biomechanical exam. The orthotic fabrication is usually done at an outside lab from both the prescription as well as an impression of the patient’s foot. Different professionals accomplish this utilizing different methods with varying degrees of success. I have found that many so-called prescription orthotics are really "pseudo prescription-like," such as those typically dispensed widely by chiropractors, that although expensive are actually no better than generic soft insoles. The pressure plate at CVS has potential to individualize arch supports for each patient's needs, but their devices reveal little perceptive differences and are no better than other mass produced cushion insoles - a far cry from custom. Many ski shops and specialty shoe stores commonly use more supportive and rigid materials made from a foot impression, but without a medical professional to take into account specific patient issues, produce devices that often lack functionality. When discussing orthotics with my patients, I commonly use the ‘OTC reading glasses’ versus ‘prescription glasses’ analogy. Minor needs may be improved with a quick, easy off- the-shelf fix, whereas more significant issues need to be addressed with a prescription. More specifically, OTC arches are effective with the average person (average weight, foot type, low activity and minor symptoms) and prescription orthotics are preferred in those with higher or lower arches, higher weight, greater activity, specific shoe fit issues, or significant bone or tendon problems. Both types are meant to be an integral part of a comprehensive treatment plan to get patients better. With so many options available to the public, it is difficult to do it alone. Before wasting a lot of time and money on inappropriate products, see a podiatrist, who remains the expert in foot biomechanics and can best help figure out what is ideal for each individual. 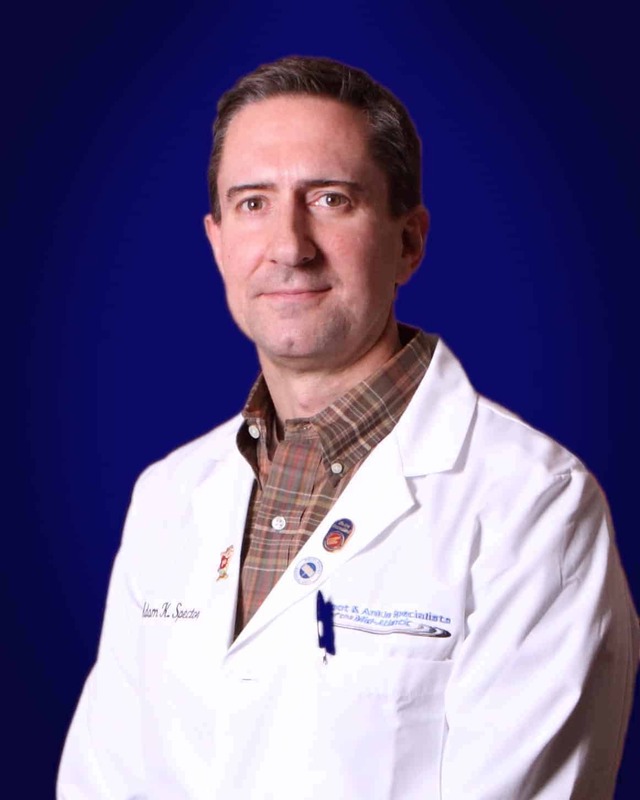 – Adam Spector, DPM Dr. Spector practices in the Wheaton (301-949-3668) and Shady Grove (240-268-7450) locations. The information on this site is provided for your assistance only; this site does not provide podiatric advice. You should never diagnose or treat yourself for a podiatric condition based on the information provided herein, and the information is not provided for that purpose. Likewise, you should never determine that treatment is unnecessary based on this information. The information contained herein is not a substitute for podiatric care provided by a licensed podiatric professional. The information provided herein is not podiatric, medical or professional advice. This site does not create a doctor-patient relationship. Doctor Spector and Foot and Ankle Specialists of the Mid-Atlantic, LLC expressly disclaims all warranties of any kind, whether express or implied, related to any products offered for sale on this web site. Doctor Spector and Foot and Ankle Specialists of the Mid-Atlantic, LLC further expressly disclaims any product warranties of effectiveness or fitness for any particular purpose or use. You are solely responsible for your use of, or reliance on, any products offered for sale herein, and any consequences arising out of such use or reliance. In no event will Doctor Spector and Foot and Ankle Specialists of the Mid-Atlantic, LLC be liable for any damages resulting from use of or reliance on any such products, whether based on warranty, contract, tort or any other legal theory. This Website, and the information contained herein, is provided to you as a service for use at your sole risk. If you are feeling ill, please call your primary care physician, or other healthcare provider. In the case of an emergency, please go to the nearest hospital.